My 4 year old daughter is learning to ride a bike. It's a whole new chapter for us as a family. Wobbles, falls, tears and then back on the bike. It's hard to watch but you know that learning a life skill comes from experience and providing guidance...not by handing her a manual on "how to ride a bike". In my last post "Time To Rethink Your Social Media Policy?" I discussed the reasons why organisations should look at their social media policy again and think more about "guidelines". Times have changed and more organisations are recognising the productivity value of employees using social media, especially when it comes to social selling. It's really important in this digital age that employees understand the risks - both personally and professionally - when conducting themselves on social media. Social media guidelines not only protect the organisation (e.g if an employee shares something that damages the reputation of the brand) but should also protect the employee. Guidance around etiquette and improper usage of social media will help the employee embrace the technology for their professional brand in a safer environment whilst potentially advocating on behalf of the company brand. So what should be included in a set of Social Media Guidelines? Opening paragraph - Outline why you're encouraging employees to actively participate in social media. Reinforce that these guidelines are there to help protect them as employees and the brand as the employer. If you're building a wider employee advocacy program, explain why the brand is helping employees to develop their professional brand online - how it assists them and how their participation can support the brand. At this point you should introduce the levels of program participation and point them to where they can get training so they can take their first step into social networking. I would encourage you to make your guidelines conversational in tone and straight forward in approach – no social media jargon that may confuse or cause ambiguity. Often employees are scared to mention their employer for fear of doing something wrong, so avoid scaring your employees further. Keep the guidelines informal perhaps even "tongue in cheek". Focus on actively encouraging employees to be transparent and enthused ambassadors of the brand. Always make sure employees are aware of confidentiality when it comes to company and customer related information. You wouldn't share confidential content at a networking event and so you wouldn't share confidential content by social media. No different. Be sure employees understand image using rights, copyright and other legal constraints that may restrict their social media usage. Make sure employees understand that they must respect their audiences and they must not be dishonourable in terms of racial, ethnic, religious or sexual slurs that may offend - their professional brand will be tied to their personal brand and such commentary isn't acceptable in the office...nor on social networking. It's not nice. Don't disclose financial or legal information around customers or clients. Be sure that employees understand the boundaries of what they should and shouldn't be sharing. Remind them of their contractual obligations to the business when they became an employee and just emphasise that social media is no different to what they're already doing. Emotions can run at a high when you're on social media, especially if you feel something or someone has been mis-represented. Spirited discussions are good. All out fights are not. We've all been there - that email that that winds you up on Friday night so you respond by hitting the keyboard with all your anger...then you walk away, return and re-write it. Same with social networking. Social is about conversations and people like to know they are conversing with someone genuine and credible. Be human, be proud and declare who you work for. Identifying yourself and that you connect to the employer brand as an employee is good in terms of transparency and credibility. At the end of the day people are your brand. Encourage them to be proud of that association. Encourage employees to talk in the first person on social media. Social networking is what it says...social. A channel for discussions, conversations and networking. People don't have conversations with logos - they have conversations with people. Encourage employees to think about their audience and serve their audience. Building a community by adding value and encouraging their community members to engage is the right kind of usage for social media. No-one wants to convert employees into marketing megaphones. Teach them to learn and share. Tell employees to be the first person to respond to mistakes. Don't leave it and wait. Tell them that if they've made a mistake on social media make some headway towards fixing it and setting the record straight. Still not happy? Contact the social media team. This might be a good time to remind employees that the Internet remembers: always pause and think before posting. The Internet remembers what you do and it records it. If you delete that tweet the chances are someone has retweeted it or shared it. You deleting it from your twitter profile will not delete the shares that have already taken place. No one is perfect but if you use your best judgement and common sense when engaging on social media you won't go far wrong - remind employees that this is how they already operate day-to-day. Not everyone wants to have their photo shared all over social media. Give some thought into the conversations that you have offline with your colleagues or customers and give guidance around maintaining the privacy of those conversations. For example if you go to an event and you take a photo it is only polite to ask permission of the people in the photo if you can post it to social media. 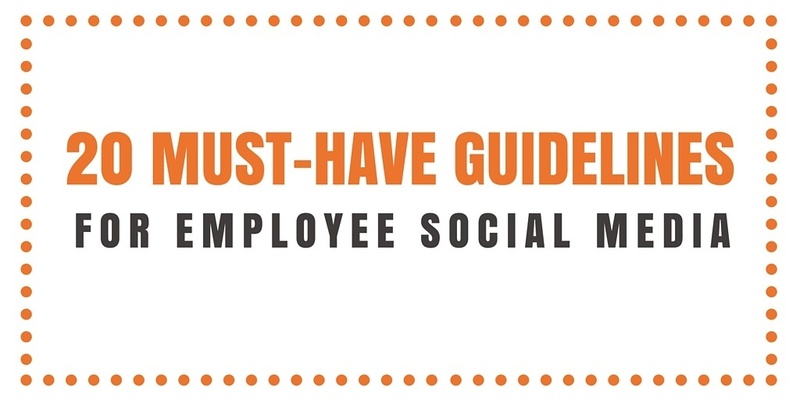 Encourage your employees to follow your branded social channels. It is a great place for employees to start engaging in content that is "safe". Employees will know that content from their employer is going to be branded and ready for sharing. They can start engaging with easy content that will help them ease into social networking. Provide a point of contact. Employees may come across conversations that they won't be able to participate in e.g. a journalist has contacted them. In such cases make it easy for your employees to contact someone internally so they can easily step out of the discussion. Be sure that you tell your employees that any activity they participate in on social media may appear in the brands social monitoring feeds (assuming you have them!) and that it is likely that their participation may feature in the monitoring feed. Many organisations will have a code of conduct already in place. When employees sign the contract to join the company, a code of conduct is often used to inform employees on how the company expects them to behave. Remind employees that the code of conduct is also relevant to online activity. Explain to employees that they should never commit the company to resolution - take it offline. It's not right nor reasonable to expect employees to commit the brand to follow up on something specific without doing due diligence or further investigation. Just remind the employees of customer service protocols for dealing with complaints. Remind employees to think about what they post before they post it. Help them realise that they not only need to take care of the potential risk to themselves but also the risk to the brand. Stop, pause and think before posting. It's easy to get swallowed up in social networking so just remind folks that it's there to assist their role. Employees that activate their professional brand online will open up new opportunities e.g. speaking opportunities, new customers, learning from others. It's a great way to connect and build their own network...for them! All that said, the proof is in the execution. Don't write the document, host it on the intranet and hope folks find it. Encourage employees to collaborate in building the guidelines. Have a launch party. Do a desk drop. Use the re-launch as an excuse to find your social superstars and potentially your best advocates. Combine guideline training with "personal brand" training to engage the audience in something that helps them develop. Ford: A bit dated but a great example of how to get your guidelines to fit on one page. IBM: Lengthy and wordy but probably the most comprehensive you'll find. SAP: Shout-out to my previous employer - bit dated but it got us all started! Let me know if you feel in your missing and potentially we could come up with the ultimate list of guidelines for social media and employees - let's help each other out! If you need any assistance in creating a set of guidelines for employee social media or indeed launching an employee advocacy program within your organisation, please do not hesitate to reach out.